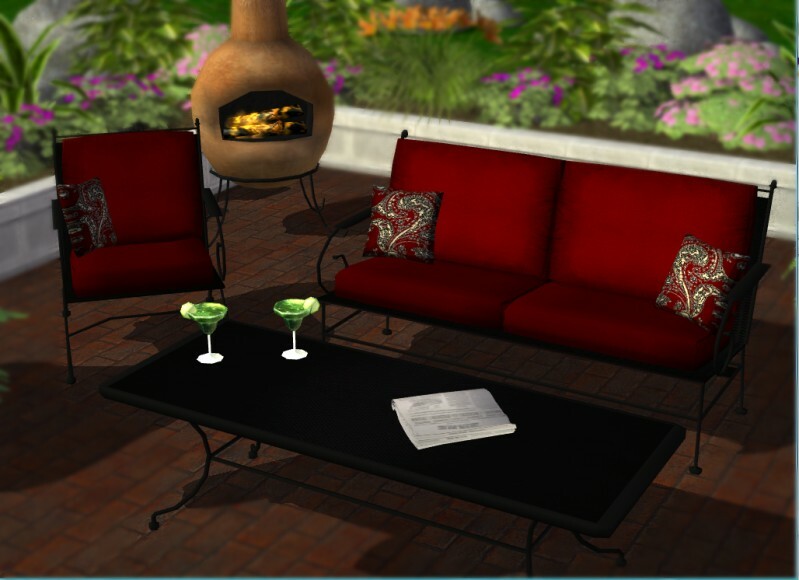 This set includes chair, love seat, table, and a chimenea (outdoor heater). Comes in red with black, blue, and tan recolours. 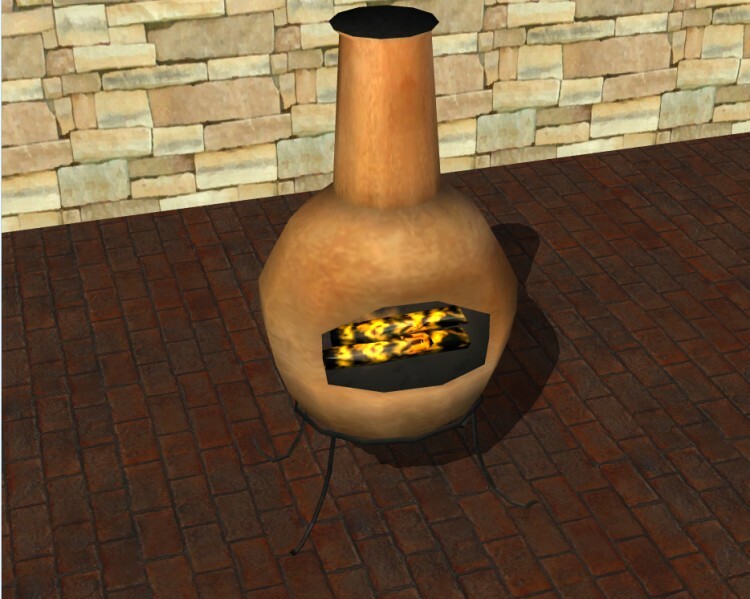 Chimenea fire is animated with "light" "warm self" and "poke" options. The margarita is now available here. Thanks to Numenor for the fireplace template. Thanks to the Moderators of MTS2 and the #create Live Chat crowd for their honest and constructive opinions, and the makers of SimPE and Blender. First!! Love it cmo! Now, I'll take 3 Margaritas! Awesome! This is so cool! Great Job!! Check out my other downloads at my blog! Very nice set....thank you for sharing it!! Awesome cmo! AND THE MARGARITA TOO! THANK YOU!! AND THE MARGARITAS ARE A WONDERFUL TOUCH!! Bunnies for you! It neads to be a featured item! oh this is gorgeous And with summer approaching I find myself in the mood for outdoor's decorating. My Sims will enjoy this set. SUPERB work cmo! well done on this fab set! Is the chimenea flame animated? Would be great. I think that piece would work well in my Mexican and Southwest neighborhoods, and for medieval sims. Nicely done. Yes it is! It works just like a fireplace with the "light" and "poke" options. It was made using Numenor's custom fireplace template (1 tile). I love it! And *squeal* for the margaritas! 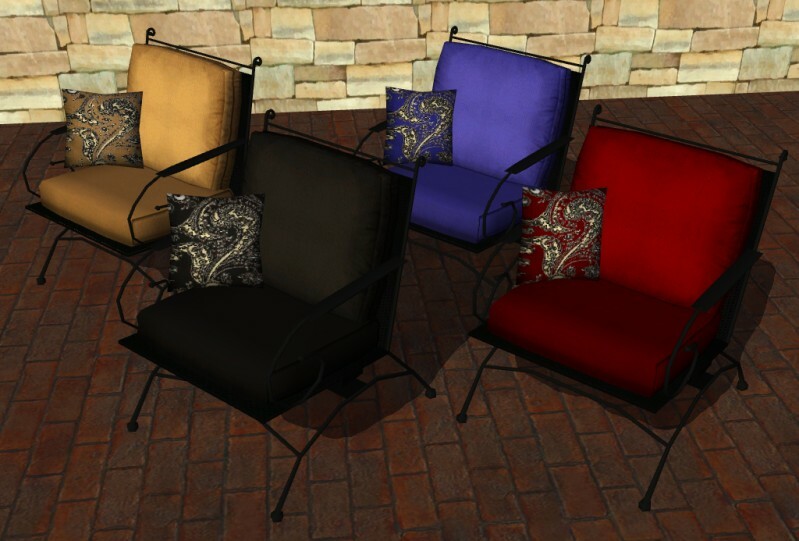 As soon as the downloads start working for me again, these will be the first I grab! Very nicely done.... Chimenea rocks! Let me know if you use any of my recolors in a story, video, etc. I'd like to see it! This message has been deleted by Adelheid 1203. This set looks great! Thank you for sharing! Beautiful job Cmo! Makes me feel all summery. I'm worried that my latest Salvation Army donation will result in homeless people looking like sluts from the 90s. ooh. 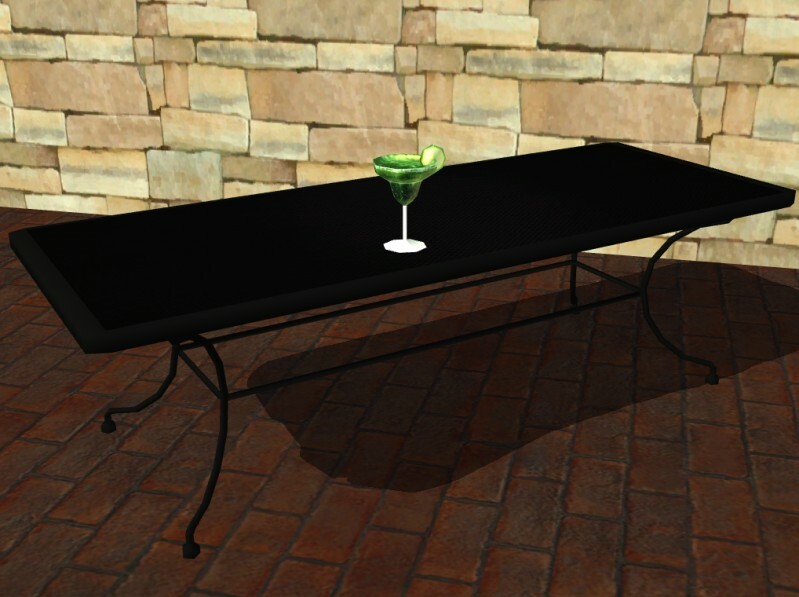 another marvelous patio set. and it comes with the margaritas!!! i've been watching lol! but not nagging, i would like to point out. Sorry - drank too many margaritas and was comatose for 4 days......came back to say thanks!! Really good set, I love the colours and mesh. I know this is base-game compatible, but does the "Warm Self" option warm cold Sims with Seasons installed?